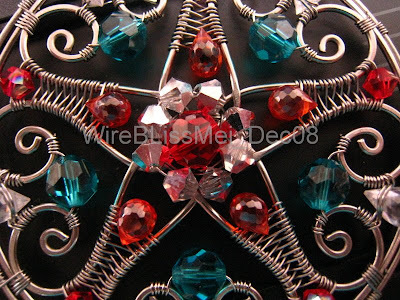 A customer of mine is attracted to her Samsara Mandala pendant when I showed her Erin's creations. She requested that I create something similar. I didn't promise her but said will try as I have yet to try out her tutorial. 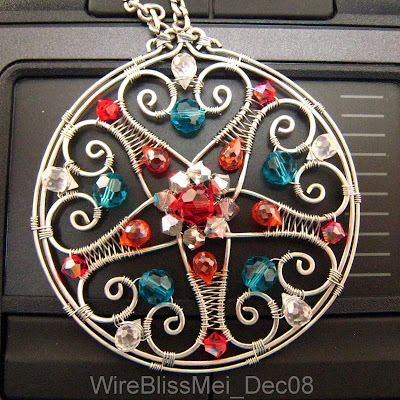 This pendant looks simple but took the longest time for me - almost two days. The longest time was spent for measuring all the separate pieces that formed the pendant. Then its the wire wrapping which need to be done carfully so that all the separate pieces are spaced out evenly and the shape stays. At closeup, the pendant looks like a starfish. 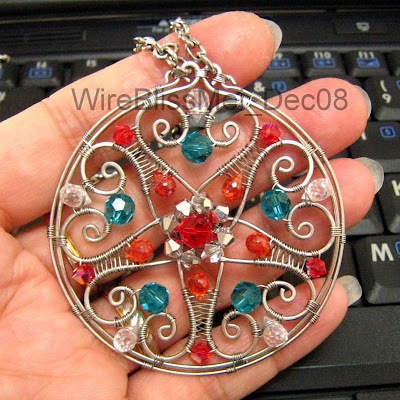 This pendant measures 5.5cm in diameter and created with 20ga and 28ga wires. Thank you Erin for the inspirations.